The now former CEO will also be in attendance at an Oireachtas committee next month. John Delaney, the former CEO of the FAI. THE FOOTBALL ASSOCIATION of Ireland have today confirmed that John Delaney will take a substantial reduction in salary in his new role as the Association’s Executive Vice-President. After a week of controversy that began with The Sunday Times revelation that he paid the FAI a short-term bridging loan worth €100,000 in April 2017 to cover a short-term cash flow problem, it was announced last night that Delaney was stepping aside as Chief Executive to take up a newly-created role entitled Executive Vice-President. As CEO, Delaney’s salary was €360,000, having once been as high as €450,000. In his new role, Delaney will retain many of the duties he had as CEO, including all matters pertaining to Uefa and Fifa, FAI tournament bidding projects, and membership of the Board of the Aviva Stadium. In the new position, he and the FAI’s new CEO will attend board meetings but will not serve as members of the board. The creation of the new position of Executive Vice-President was recommended by Jonathan Hall Associates, who recently conducted an independent review of the FAI’s governance structures. Chief Operating Officer Rea Walshe has been appointed interim CEO, with the FAI today confirming that a recruitment process will begin on Monday morning. Interviews are expected to be held in early May, and the Association hope to unveil the new CEO at their AGM in July. Today’s FAI statement did not clarify whether John Delaney would be involved in the recruitment process. The FAI did confirm, however, that Delaney will attend a meeting with an Oirechtas Committee on Sport next month. Having initially been slated for 20 February but postponed owing to Delaney’s Uefa commmitments, the Committee meeting has been rescheduled for 10 April. The FAI have offered to bring it forward to 3 April. The date has yet to be confirmed, but Delaney will be in attendance. Email “FAI confirm John Delaney to take substantial reduction in salary with new role”. 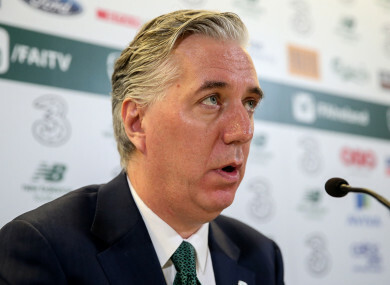 Feedback on “FAI confirm John Delaney to take substantial reduction in salary with new role”.